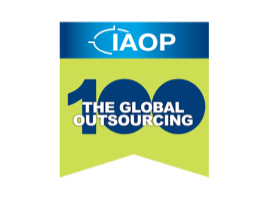 February 20, 2017, Washington, D.C. – For a fifth consecutive year the International Association of Outsourcing Professionals® (IAOP) recognized Miratech as one of the world-leading outsourced service providers on The Global Outsourcing 100® (GO100) list. IAOP publicly released the full list of The GO100 Providers on February 20th at the Outsourcing World Summit, OWS17, in San Antonio, Texas. The list also appeared in the June 2017, 2nd Quarter special Fortune 500 issue of FORTUNE magazine, in a special advertising feature produced by IAOP, as well as on IAOP’s website at www.iaop.org. The applicants received for the list are judged by an independent panel of IAOP customer members with considerable proficiency in selecting outsourcing service providers and advisors for their organizations. The criteria to make the list is based on a demanding scoring system through a judging process that is led by IAOP Chairman Michael Corbett, and CEO Debi Hamill. For companies looking to develop new partnerships with leading technology service providers, the GO100 provides a valuable resource. Miratech’s inclusion exemplifies how the organization brings more value to the market and in their close relationships with clients. Governance tools like Miratech’s Managed Competence Center (MCC) improves predictability, accountability and transparency. Unique tools and processes like the MCC enable Miratech to maintain a 99% success rate on all projects, far above the industry standard of less than 50%. This, combined with their global presence, top-talent teams, and proprietary products and services is proof that Miratech’s Relentless Performance delivers the best solutions to the marketplace. IAOP is the go-to association leading the way to improve outsourcing outcomes by bringing together customers, providers, and advisors in a collaborative, knowledge-based environment that promotes professional development, recognition, certification, and excellence. With over 120,000 members and affiliates worldwide, IAOP is not only on top of the latest trends, but also in front of them. Through its expansive global chapter network, premier training and certification programs, knowledge center, member community, and more, IAOP helps members learn, grow and succeed. For more information and how you can become involved, visit www.IAOP.org.